RSNA (Radiological Society of North America) is the largest annual trade show in the world, with about 55,000 people in attendance for the 6 day event in Chicago, Illinois. The expo includes a large number of presentations and courses on science and modern radiology. RSNA 2011’s two main themes were lower radiation dose in diagnostic radiology imaging (especially CT) and new technology. For lower dose, there was much material on tailoring a CT scan exactly to an individual patient – based on their body size, their cardiac output, their disease process, or the type of diagnostic challenge. Additionally, a lot about new iterative reconstructions in CT – both statistical and model based, was presented. Either method lowers dose a lot, but model based results in lowered radiation exposure by up to 80%. New technology presentations and courses covered a range of topics including dual energy CT for better tissue characterization, and the combination of imaging modalities in one platform – like SPECT/CT, or PET/MR. These combined modalities may provide a better combination of disease identification plus precise localization. In all, RSNA 2011 offered great insights and interesting presentations. Did you attend? Share your thoughts below! A recent presentation at the 2011 International Society for Computer Topography (ISCT) meeting in San Francisco highlighted the effectiveness of using dual- energy CT for abdominal imaging. This CT- technique has become more promising for uncovering certain pathology that has otherwise been hidden by traditional diagnostic imaging procedures. Dual- energy CT- by whatever technology – can be configured to employ less radiation than single energy CT. But for some specific applications, it produces more diagnostic and specific information. Dual- energy CT currently may be the best radiology technique for characterizing urinary tract stones to their chemical composition (which determines whether medical, shockwave, or laser therapy will be required), characterizing small renal masses, and characterizing liver masses into cyst versus tumor. Additionally, dual- energy CT may apply to better detecting minimal liver tumors, lowering the amount of iodine needed for CT angiograms, and creating virtual non- contrast scans. 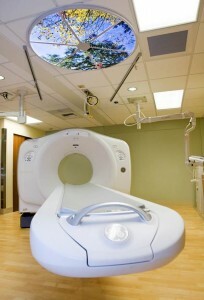 The latter may reduce the overall CT radiation dose of a multi- phase study by 20 to 50 percent! While dual- energy is still relatively new to the field, it is clear that it is a promising technique for CT dose reduction, while maintaining imaging quality. Further research and testing will be conclusive of the absolute benefits of dual- energy CT.